WHAT’S INSIDE SMALL BATCH SELECT? As you know, it’s an exciting time for the Four Roses family, and we’re happy that you are able to join us in celebrating the debut of the Fourth Rose––Small Batch Select. Non-chill filtered and bottled at 104 proof, Four Roses Small Batch Select marks the first permanent addition to our portfolio of premium Bourbons since 2006. Small Batch Select will first become available to the public today, April 17, at both the Distillery and Warehouse & Bottling Facility Visitor Centers. Small Batch Select will be available at retailers in Kentucky, New York, California, Texas and Georgia in the following weeks, and will be in additional markets in the future. Check out what Master Distiller Brent Elliott had to say about this all-new Bourbon. Which recipes were chosen for Small Batch Select? I selected and mingled recipes from both mashbills and three yeast strains––V, K and F––each aged a minimum of six years, to handcraft Small Batch Select. This bottle will feature OBSV, OBSK, OBSF, OESV, OESK and OESF. Is there a particular recipe you were most excited to include in this product? I am very excited about the F yeast. We rarely use it in other products, outside of Four Roses Bourbon (5 percent), the private barrel program and a few limited edition offerings. I started exploring with the F yeast in 2014 with the Limited Edition Small Batch, used a bigger portion in Al’s 50th Anniversary Limited Edition Small Batch in 2017, and have been looking for more ways to use it throughout the past few years. What makes the F strain special? The F strain has very defined characteristic. It’s one-dimensional on the nose at younger ages, but becomes more complex at an older age. It just takes a little bit to go a long way in a blend. Small Batch Select has 30 percent of the F strain. The defining flavor is achieved through the F/V yeast combination which creates a unique, candied fruit flavor balanced on the palate with the warmth and spice of the K yeast batches. What kind of Bourbon drinker did you have in mind when handcrafting Small Batch Select? We felt this was the sweet spot to hit a lot of Bourbon lovers and would be enjoyable to both casual drinkers and Bourbon connoisseurs. It’s all new, but at the same time, it’s an extension of what we do, and what we do well. It will attract people who enjoy innovative products, but will also appeal to our current consumers. How is Small Batch Select different from Small Batch? Small Batch and Small Batch Select are as different as any two Bourbons from our Distillery can be. I am excited for you to try it and see for yourself. 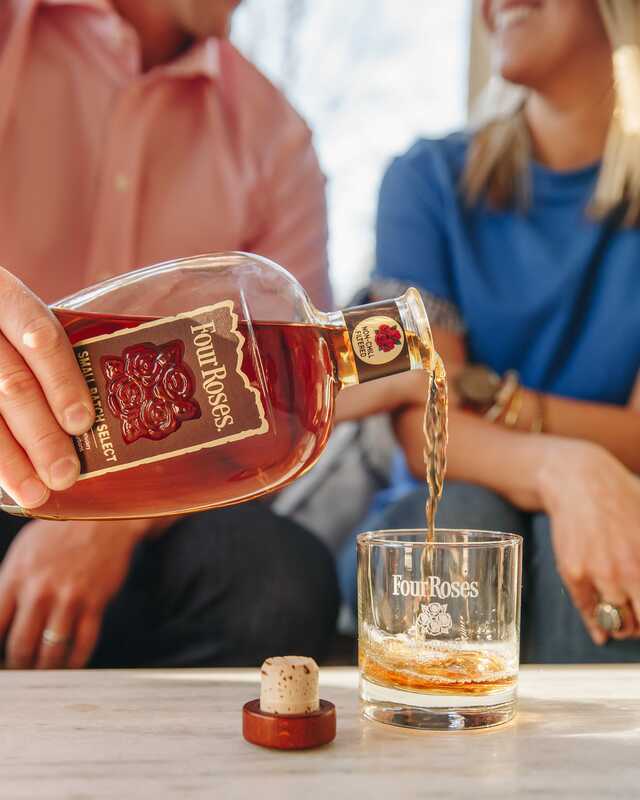 Four Roses Small Batch Select is a proud achievement for the Four Roses Distillery and confidently lives up to the legacy our company has established since 1888. Learn more about Small Batch Select here.